At our local genealogy society, I get to teach a four-week beginner's course on using Legacy. At the beginning of each class I present some kind of technology tip. This week I demonstrated how to add a citation to a digital image. In the video below (a partial recording of yesterday's class), I demonstrated first how to create the perfect citation (using Legacy's SourceWriter and the Source Clipboard) and then how to paste it into the digital image. We previously wrote about this here with step-by-step instructions. We have a great new update for you to download. Our development team has been working hard at enhancing Legacy's features and correcting minor issues you have reported. Many of the additions/changes are the direct result of your suggestions - thanks everyone! Since our last major update (version 7.4 released on January 30) there have been three minor updates. Installing the latest update (see instructions below if needed) will keep you current. Below is a list of enhancements and corrections since January 30. There's a good number of minor issues that have been recently resolved. For a list of what has been fixed, click here. You can now manually add or change a FamilySearch ID (Person identifier) in the Individual's Information screen. New temple icon - the temple icon with a red X indicates that more information is required for ordinance work. There is also a new filter for "ordinances needing more information"
Added a Reload button in the main toolbar with three options: 1) Reload Legacy database. 2) Reload current person (use this if you've made changes to a person and want to "refresh" their information in LegacyFS. 3) Refresh FamilySearch information (this will check the refresh ordinance status for all linked persons to get the most up-to-date status. DNA - added the DYS635 and Y-GATA-A10 markers for Ancestry's Advanced Paternal Lineage Test (Y-Chromosome 46). 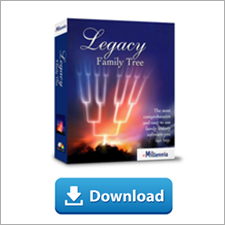 "Can I use Legacy to trace more than one set of parents without creating two different family files?" First, notice in the image below (click to enlarge), that John Brown's parents are Charles and Sally Carter Brown. Let's assume that these are his biological parents. 1) Click on John's "Parents" icon. The "Parents of John Brown" screen appears. In the "Relationship to Father" and "Relationship to Mother" fields, you should enter how John is related to each parent. 2) Click on the "Add New Parents" button. 3) Click on "Unknown & Unknown", and then click on the "Add Father" button. Add the information for the father and click Save. Do the same with the "Add Mother" button. Add her information and click Save. 4) Enter how John is related to the second set of parents in the "Relationship to Father/Mother" fields. When you click on the Select button to return to the Family View, you'll notice that John's second set of parents appear above him, and John's Parents icon now has the number 2 next to it, indicating that he has two sets of parents. When you want to navigate between the parents, just click on this icon and select the other set of parents. I think this should answer your question Tim. Do others have experience in researching/recording two sets of parents? Do you have other suggestions? SALT LAKE CITY–It is rare that Marcia Covington can make the trip from her home in State College, Pennsylvania, to the Family History Library in Salt Lake City, Utah. Now, however, people like Covington can take classes from the world-famous library without ever leaving home. If I were in charge of changing genealogical history, I'd make sure that all census enumerators, doctors, court recorders, witnesses, informants, priests, and others each consulted with each other before recording a person's information. They'd all agree on the spelling of a name, the accuracy of a date, and they would certainly record the person's parents, and even their grandparents. Maybe even attach a photograph too. Good research requires the researcher to record each of these conflicting dates/places and its source for further analysis. Of course, different records have varying degrees of reliability, but whichever date/place you decide is the "most accurate", record it in the main birth field (the top half of this screen). Record all others as "Alt. Birth" events by clicking on the Add button. If/when you are able to disprove one of the alternate birth events, change its event name to "Disproven Birth" and in its notes, explain why the event is disproven. Now you will always have a record of the conflicting information and the reasons for which they are disproven. This comes in handy when collaborating with other researchers. If you decide that one of your "Alt. Birth" events is the correct one and you want it and its accompanying documentation to be the "main" birth event, just click on the Options button and select "Swap with Birth Information". If you want the ability to not include these "Alt. Birth" events in a report, like a book, just mark the event as "private" by placing a checkmark in the "Private" box in the lower right of the Event screen. Then, in the Report Options' Privacy tab, select to either include or not include "events marked private". Maybe it's just me, but do you find conflicting information in your ancestors' records too? These next two months will be two of our busiest months ever teaching classes and visiting with our Legacy users. If you're in Arizona, British Columbia, Iowa, Quebec, Utah, or Washington we hope you'll stop by and say hi. If you live in Arizona, Australia, Alberta, British Columbia, Denmark, New Zealand, California, Florida, Indiana, Massachusetts, Oklahoma, Oregon, Texas, Utah, or Washington, we hope you'll attend your local Legacy User Group meeting. USA | Utah | St. George - March 23/24/25, 2010. St. George Regional Family History Training Center located across the street from the St. George LDS temple. This is a 3-session Legacy class of two hours each day. 6:00-8:00pm. 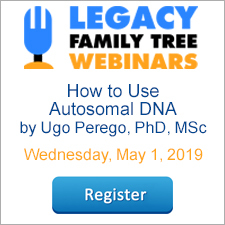 In addition to the demonstration of how to use Legacy, students will also have hands-on practice along with assignments and handouts to best learn the software. Registration is limited, but is open to anyone. Contact David Midgley for more information. USA | Arizona | Sun City Grand - April 1. Sun City Grand Computers Club. Legacy's Geoff Rasmussen will teach a class about Legacy. Visit http://www.grandcomputers.org/ or contact Leon Chapman for more information. "How can I show the age of the persons in the starting display?" Viewing the age of the main persons in the Family View is simple with these instructions. 1) First, in the Family View, click once on any of the blue labels next to the main persons. The labels, by default, display "Born, Chr, Died, Buried, DthCau". Just click once on any of them. 2) On the resulting Customize Display screen, decide which of the five fields you want to replace by clicking on the small button with the three dots. 3) Click on "Age At Death" and click Select, then Close. Here's another trick. Go to View > Ages and you'll get a lot of other interesting information about the couple's ages. Finally, here's a trick to add the "Age at Death" to the Index View. 1) Click on the Index tab, then the Options button, then Customize Columns. Using the same button with the three dots, select Age at Death for one of the fields. Now look at the Index View. In this example, the first column is the Age at Death. You could also place this column next to the Death Date column if it makes more sense. Well, Marcio, this answer was way more than you asked for, but I got on a roll...Hope this helps.